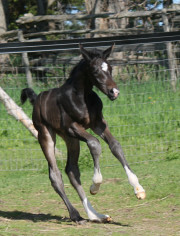 This colt was awaited with great anticipation – and we are not disappointed. He is by the phenomenal stallion “Sezuan” (Zack / Don Schufro), who scored “10” ten times in his SPT. Dressage enthusiasts follow his every move. 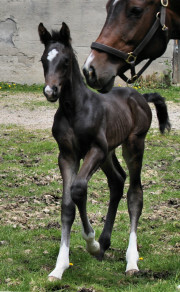 His dam is our top-producing mare “Contessa” by Contendro / SPS Eiger / Wenzel. 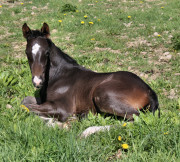 Each of Contessa’s foals that went to inspection has either been Top Filly, or Overall Champion, at their respective Foal shows. All are born with springs, great chutzpah, and beauty. 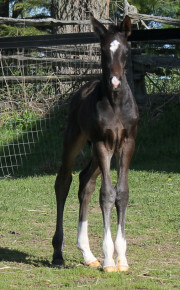 These pictures track our strong and shiny boy from one to three days old. Video is at 3 days old also. Slainte was Sold in-utero to a top-notch dressage trainer / competitor centred near Seattle Washington. I have high hopes for their partnership.